Meadows have declined in England, and our landscape is the poorer for the loss, but there is a revival. The word meadow is rich in allusions. We think of verdant countryside and people mowing it for hay.We think of the wildflowers that they allow to flourish on their carefully protected confines, and beekeepers know very well the abundance of nectariferous plants that thrive on their soils. Meadows turn up in at least one nursery rhyme and there are references to them in folk tales, but few understand them, though they know their beauty when they see them. Meadows are supremely organic. 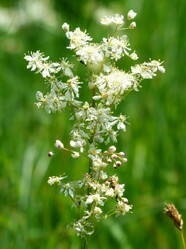 The image above, courtesy of Hans, shows meadowsweet, a lovely plant of damp meadows. He's in the haystack fast asleep. There is so much social history here that people don't pick up. The boy is a child labourer exhausted by farm work, and Boy Blue is the privileged son of the landowner, but that's by and by. What was so wrong about the sheep being in the meadow? Everything, for the meadow is the last place that you want sheep. The reason is that meadows were kept ungrazed even by cattle, as they were cut in the late summer for hay to feed the cattle over winter. Cattle and sheep graze differently, for while cattle gaze and leave grass reasonably long. sheep close-crop the ground to produce short springy turf. But the farmer needed the meadow to grow its grass long so that it could be cut for hay to feed the cattle over winter,so the close-cropping sheep in the meadow were a disaster for him. Meadows gained a reputation for being rich in wild flowers. They are generally the flowers of grassland, and the list of species to be found on unimproved English meadows is greater than I have room to list here. In the south of England there are surviving meadows which are orchid-rich, and these orchids are often rare and protected by conservationists,many of whom do not advertise to the world that the rare orchids are present. The fate of one example of the rare ghost orchid is illustrative. A specimen that was being protected by conservationists was one night dug up and stolen from its woodland home by a collector who wanted it for him/herself. Fortunately there are others. There is a fact about wildflowers little known by non-gardeners, that they prefer land that is low in nutrients, for rich soil kills them, which is why they do not thrive in gardens. Meadow soil is just the right level of nutrients for a wide range of plant species, while pasture is too heavily grazed for them and arable land too heavily fertilized. Along with the flowers comes a wide range of insects, that feed on meadow species. As the meadow grass is kept tall, tall flowers abound and thrive, so butterflies, bees and hoverflies hum among the flower tops. Lower down there are grassy stalks which provide food for caterpillars, but the rich insect life is staggering in its complexity.The Offwell Wildlife Trust in Staffordshire, in the English North West Midlands, reckons that an acre of meadow contains 2.25 million spiders and hundreds of millions of mites and other insects; and that does not allow for the edaphon [soil life] of the soil beneath. In wet meadows damsel flies and dragon flies are found, and we can see fireflies and glow worms on summer evenings as they dance their ephemeral mating rituals. Meadows are havens for British bees,threatened by the toxic neonicotinoids that farmers use to poison unfriendly insects and which poison the beneficial ones as well. You don't use pesticides on a meadow, just leave it to flourish organically, and the so the bees thrive. Beekeepers know and love meadows. I must mention meadowsweet, which was used to flavour the fermented honey drink, mead, whose name suggests a connection with meadows. Meadowsweet, Filipendula ulmaria, is a plant of damp meadows that was traditionally used as a mead flavouring. Foraging experts and mead makers still pick it where they can, but it does not grow in my area and so I have not had the pleasure of foraging for it. The Second World War did much harm, as it forced farmers to be ever more productive to meet the pressures of the German blockade, and since the war there has been a demand to drive up production on British agriculture. Meadows were a casualty of this, and many were turned over to arable land, but this was short sighted, as growing arable crops nigh to rivers allowed their fertilizers to spill over into the watercourse,causing eutrophication, the over-enriching of waterways that causes water weed to proliferate, blocking water courses, a factor in the worsening of flooding. The move away from hay to silage did not help the preservation of meadows, as silage is cut earlier than hay and does not need a meadow, so the result of this is that the distinction between meadow and pasture was lost in many cases. Silage is probably more nutrient rich than hay, but requires many yards of black plastic to wrap it. We see these bales in the fields, and the haystacks of yesteryear are now gone. There are moves now to restore meadows. The National Trust, a prestigious conservation organization, and some other conservation groups, are working together to preserve a few meadows for posterity to enjoy. 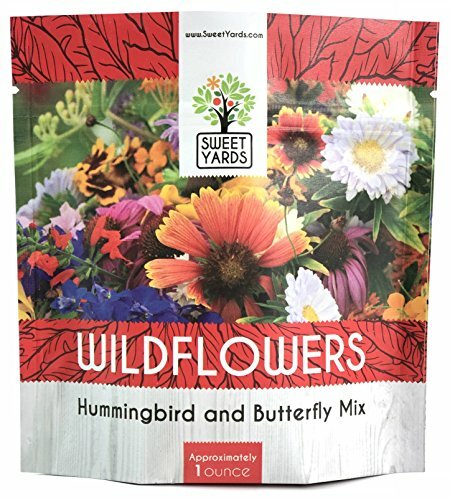 Part of the project is to collect wildflower seeds from existing meadows and distribute them to people who want to establish their own small meadow. Farmers are now paid grants to farm in an ecologically friendly way,and some of them have re-established meadows on their farms. The future for meadows and the abundance of species that thrive on them is looking healthier than it has been for many years. You would love parts of Scotland, for I have seen some lovely flower rich roadsides there. 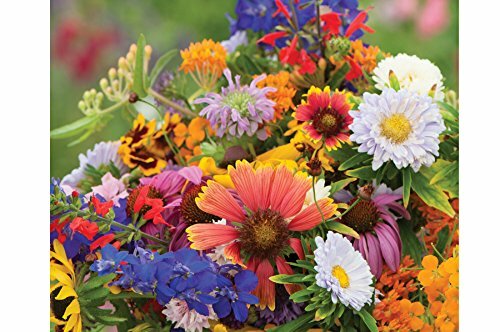 If you want to grow wild flowers, which you can do from a wild flower seed mix, ensure that the soil where you are growing them is not too rich. I believe wildflowers offer much aesthetically In this area we have no meadows, most of the land is a swamp. However, on the median of our highways occasionally wildflowers do grow. I once observed tractor mowers literally, and unnecessarily, removing wildflowers. On one part of the highway was just green, but past the mowers were expanses on different colors. I can imagine a field with patches of different colors in bloom.. Absolutely right about the honey. 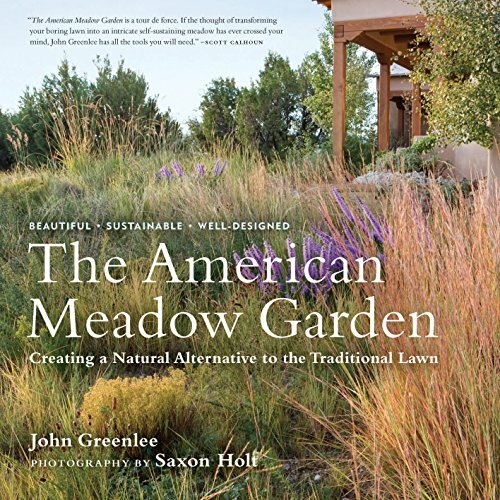 Thanks for highlighting the wonder of meadows. That clover would make great honey!